In celebration of their fantastic second album, Beyond Celestial Echoes, we caught up with the members of the Greek four-piece Sacral Rage to delve a bit deeper into the albums that changed their lives and which continue to play a vital role in the sound of one of modern music’s most undeniably, and apologetically, metal acts. One look at the cover of Beyond Celestial Echoes should give you a pretty good idea of what you’re getting into. This is technical, thrash-infused heavy/power metal at its finest and most gloriously over the top. The band’s logo pays obvious homage to Voivod/Vektor. Yet, while the band’s playing pays frequently homage to tech-thrash giants such as those and Watchtower, among others, the overall experience of the record suggests something more akin to King Diamond, with a sprawling space opera narrative in place of the King’s campy horror. The album is an eclectic effort, to say the least, while also being one that wears its variety influences proudly on its sleeve; and the level of enthusiasm shown by the band’s members for their forebears is nothing if not charmingly infectious. Complex but not meretricious, direct but not simple, technical but not pretentious—this record had a colossal influence on the way we have formed a natural barrier between the two most significant elements of the band: aggressiveness and lyricism. From the complicated tunes along with the bizarre convolution of “Imperiled Eyes”, through the immediacy and straightness of “Kraft Dinner”, to the outburst of emotion in “Stonewall”; the whole album is a masterpiece in the history of Heavy Metal. Unquestionably, only a few other albums could have made us see the entire world of music and creativity in a more sophisticated point of view. It is not just that we are dedicated fans of most of the genres of Heavy Metal that pushes us to admire Never, Neverland, but also we think that the way each and every musical second of it, is unique. It is perfect how Annihilator have managed to create such a strong connection between the parts of every song. Every single riff should not have been in another position. Moreover, all the ideas included could not have been attributed better. It is not a secret that our style, in a way, owes a lot to the manner of the unexpected changing of riffs that happens in this record. The way the one riff comes after the other and makes the audience need a little time to realize what just happened, surely had a strong impact on us trying to give a shape to our music. As to the production, the clarity of each instrument’s expression and the brightness in every single tune, but with lots of old school aspects, had a beneficial influence on Sacral Rage’s character. Last but not least, although our vocalist, Dimitris, is known for his comfort to sing in high frequencies, you should keep in mind that when we started the band, one of his favorite singers was Coburn Pharr. The reason was that he actually had ”helped” back then to find more possible ways on how he could manage to reach lower and more aggressive volumes. Without Never, Neverland for sure our space would be poorer and less innovative. Don’t Break the Oath is the kind of a record that has all the elements that I—as well as my bandmates—adore in Heavy metal, such as the energy, the melodies, the shock factor the feeling and the adventureness. It just has it all. Every aspect on this album is just over the top. It’s like you blended Priest, Scorpions, Sabbath, Michael Schenker as well as little bits of black magic, and the result you get is fatal. Heavy metal on steroids!! What you have here, is an unstoppable King Diamond accompanied by the best guitar duo in metal history. Such a deadly combination. They were playing by their own rules and it’s no surprise that they influenced most of the extreme metal bands. Also, let’s not forget that Don’t Break the Oath, as well as Melissa, are respected from the majority of the metal community. This record is a Roller Coaster of feelings, images and sounds; from the morbidity of “Desecration of Souls” and the gentle “Welcome Princess of Hell”, to the vicious “Nightmare” and the excellence of “Come to the Sabbath”. The riffing is Razor sharp and the songs structures seem endless. I really do believe that they never end. It’s like a continuum flow of sounds that floods into your body and possesses you soul. Just listen for example the title track [The Oath]. Upon thinking that the song is over… take that lead in your face. What? It has more than that? Guess what, take this cutthroat falsetto and learn that from now on, you should pay respect to the King! Well, that happened pretty much to me when I was 13-14 years old. Luckily for me, this record is a landmark for the other Sacral guys too. Each time we need inspiration, we know where to find it and we are not afraid to use it. Don’t Break the Oath is the benchmark for the quality of our work. Mercyful Fate is one of the few bands that we seek to show their influence within our songs. I am really proud that we’ve been asked by Metal Hammer to cover a song out of this record. This was one of our peaks as a band. Holding this vinyl in my hands, seeing the (un)godly cover of H.R. Giger and listening to the “Innocence & wrath” intro for the first time was one of the most intense musical experiences of my life. Ι didn’t know if Ι wanted to bang my head or just stand to pay respect and then bow to their majestic morbidity. From the beginning till the end, this album sounds like an enemy-crashing barbarian invasion. Surrender or DIE! Along with classic doomy parts, this album (as much as their earlier material) has a really punky vibe. To my ears, it sounds like a mix up of (old) Saint Vitus, (old) Death SS (of Paul Chain era) and GBH/Discharge—probably because of Reed St. Mark’s d-beat paroxysms on songs like “Eternal Summer” and “Circle of the Tyrants”. The highlight of this record is [Tom G.] Warrior’s phenomenal vocal performance: raw, grim, aggressive and with the right amount of “Ugh”s and “Heyyyyyyyyyyyyy”s. The album also features some innovative yet unconventional moments throughout, such as Wolf Bender’s French horn and Claudia-Maria Mokri’s operatic falsetto—both of which would help define the subgenre of avant-garde metal, in which Celtic Frost are often labeled. The open-minded mentality of Celtic Frost is the perfect example for me that creativity has no boundaries; which is the number one rule of every member of Sacral Rage. For your maximum pleasure, I recommend that you listen to this record while reading an issue of Savage Sword of Conan (1974–1995); or watching the Conan the Barbarian movie (1982). All hail the morbid wargods!!! Florida nowadays is most known around the metal world for its incredible death metal scene. Names like Death, Morbid Angel, Obituary, Deicide, Nocturnus—the list can go on for a while—are good reasons for someone to be devoted to the death metal genre. But, back in the day, Florida used to have a very active classic metal scene too. Nasty Savage, for example, used to be the local heroes. All the members of the big death metal bands had them as idols and you could find them among other fans in all of their gigs. Also, one of the greatest metal band of all times, Savatage, is located at the same place and you could find some more great bands in the underground lobbies as well. Oracle, Attika and Oblivion are some of my personal favorites. So, we have the local heroes, the big star and the underground scene… What are we missing here? I think that the missing link is an underrated gem and it couldn’t be any other than Crimson Glory. This band possesses two of the most iconic albums in our music’s legacy. Five guys with incredible talent came up with a sound that was powerful, melodic and aggressive at the same time, dramatic and technical. I won’t describe how each song sounds and differs from the other because you really can’t get the outcome with words. I’ll try to describe the feeling I have when I listen to their music. If you close your eyes you can see millions of images. You can time travel from the middle ages to the unexplored skies. Always with the feeling that everything takes place in the night, where you feel the darkness covering the atmosphere like a veil, creating a more dramatic aura. In every shattering piking, drum pounding, bass trembling and furious screaming (oh my god those screams) you feel like following your eternal leaders and you want to scream with them until your voice fades out and still keep screaming. Crimson Glory broke the boundaries of classic metal with their prog mixture and achieved fans from all of the spectrum of metal. I guess it doesn’t matter how people categorize your music when it’s that good. Extra emphasis must be given to how good the vocals are. Midnight had everything that a singer could wish for. He had an outrageous range, a beautiful color in his voice, he was a genius composer capable of writing unbelievably memorable melodies and his interpretations were full of emotions and drama. All that in addition with the great music of Crimson Glory made me believe that Transcendence has the best vocals from all the metal albums and that makes Midnight, in my mind, the Freddie Mercury of metal. Eternal gratitude for your music! I might be doing something different if you didn’t exist. R.I.P. John Patrick McDonald, Jr. (1962-2009), best metal singer of all time!!! 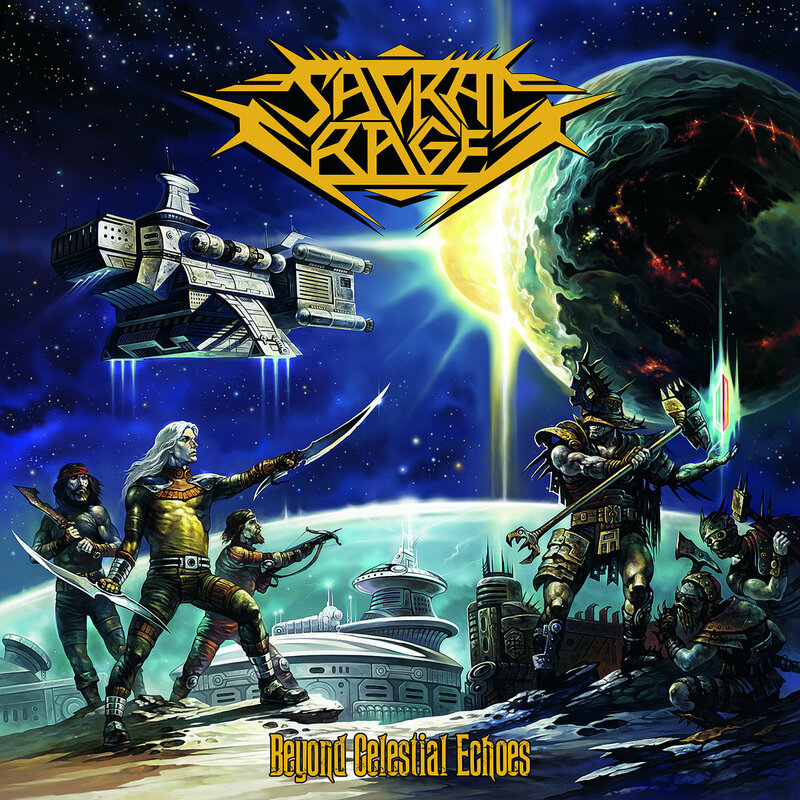 Beyond Celestial Echoes is out now, through Cruz del Sur Music, and can be ordered via Sacral Rage’s Bandcamp page.